Pop Quiz: Who Created the Wonderlic? Eventually it'll be known as "The Krause." That's the prediction Tony Award-winning playwright and director Frank Galati (C65, GC67, 71) made about the Alvina Krause Studio, a new black box theater in Annie May Swift Hall, during a dedication ceremony held on Reunion Weekend last October. 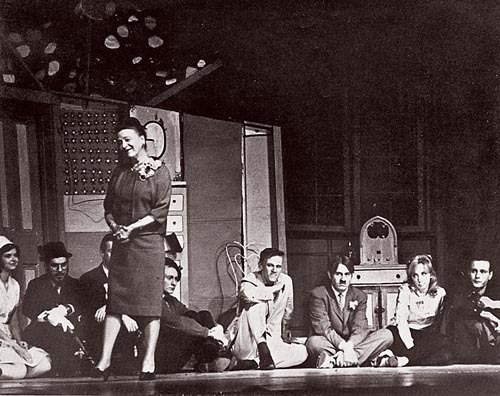 Krause (C28, GC33), a legendary theater and performance studies professor, helped create the acting curriculum at Northwestern, focusing on instruction in technique with deep engagement in a canon of dramatic literature. She taught at the University for 33 years, and her students included Charlton Heston (C45), Patricia Neal (C47, H94) and Garry Marshall (J56). "She led us to believe that if we were going to be actors we had to be activists, that the purpose of theater was to stir the heart and the intellect not just to self-awareness but to social consciousness," said Galati, one of Krause's former students, in his remarks at the dedication. The School of Communication dedicated the new space during "A Celebration of Acting at Northwestern," a series of presentations during which faculty and alumni remembered Krause and discussed the acting program's future. The school also created an endowment fund in her name. Krause became professor emeritus in 1961 and continued as lecturer until 1963. She died in 1981.